The second book in Ada Palmers incredible Terra Ignota series. 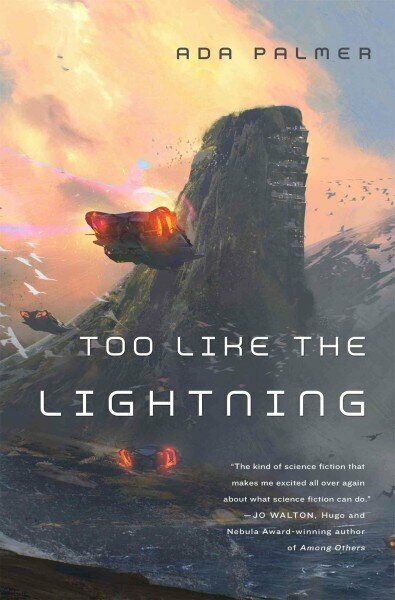 This one picks off exactly where Too Like the Lightning ended, and moves along at a blistering clip through scores of plot revelations, and extended explorations into the nature of gender, the place of violence in society, the complexities of competing duties, the nature of divinity and more. I can’t get enough of these books. The world Palmer has built is incredibly complex and nuanced and I fear I’ll never get to see as much of it as I’d like to. The books are overflowing with ideas sometimes, almost too many to keep up with, and the writing is clean, clear, and often funny. If I have a quibble, its that at times it feels rushed. Palmer has so many plot points to tie up that reveals happen at a breakneck speed and not always with the level of pre-work I’d like to see. Still and all, there is so much here. Including real insights into what the future might look like, and fascinating explorations about how we might view our own history in coming eras. Recommended (for a certain type of big idea SF loving) enthusiast. I read the Shipping News in 1997 when I was twenty-two years old. It is hard to articulate now the effect it had on me. It’s moving, its beautiful, and it’s the first time I self-consciously realized I was reading a literary novel. I’d read other serious novels before, of course, but this was this was I think the first book where I began to understand the “literary” novel as a genre unto itself. Shipping News is a book where the language (gorgeous) and structure (complex) matter as much as the plot (haunting) and characters (pitch perfect). Much of the literary novel genre attempts to incorporate these elements, but end up being boring books about Brooklyn writers writing about writing. Not the Shipping News. There are thoughts on writing, yes, (our protagonist is a journalist who covers, of course, the shipping news in this port city in Newfoundland) but they lie in background, behind the lives of haunted characters. As it should be. But it isn’t the plot I remember best. It’s the scenes in Newfoundland, the description of the loneliness of this port city, that resonated with me and sent me looking for others books with tasteful covers and authors with MFAs. Very few have been as good as the Shipping News, which you should read before you pick up that next book written by a Jonathan living in Brooklyn. If not the best novel I read this year, among them. Super-duper icky and disturbing, but deeply compelling story of a scientist who travels to a remote pacific island and finds a substance that can allows those who eat it to live forever. Basically (and intentionally), a b-movie plot on the surface, but told in a way that is really, really not b-movie style. Gorgeous writing, featuring deeply troubled characters, horrific (sometimes sexual) violence, child abuse, ecological collapse, terrible family dysfunction, the works. It isn’t an easy read. There were times when I felt physically sick from descriptions, but it tells us something, about the scientist at the center of the story, but also about the way we interact with each other, with that which is new, and with that which is different. It’s an important and challenging book and I’d really like to talk to you about it. You should check it out. Smarter minds than mine loved this book. A sort of stream of conscious narration of the life of a women in a small (Irish?) village. The book is often funny, and at times beautiful. The writing is excellent, with complex sentences that are perfectly structured, and the observances of the details of everyday life well done. Still, it left me cold. A bit too clever. Good writing, even great writing just isn’t enough for me right now, and careful observations of the mundanities of life just aren’t going to cut it. Still if language is your thing, this book may be much more up your alley.